In my We are not alone posting to this blog, I provided a list of DWF Partners who have built applications around DWF. Most of these partners started by downloading the free DWF Toolkit from the web. The DWF Toolkit is intended for C++ programmers who wish to develop an application that reads or writes a DWF file. Downloading the DWF Toolkit continues to be a popular activity. 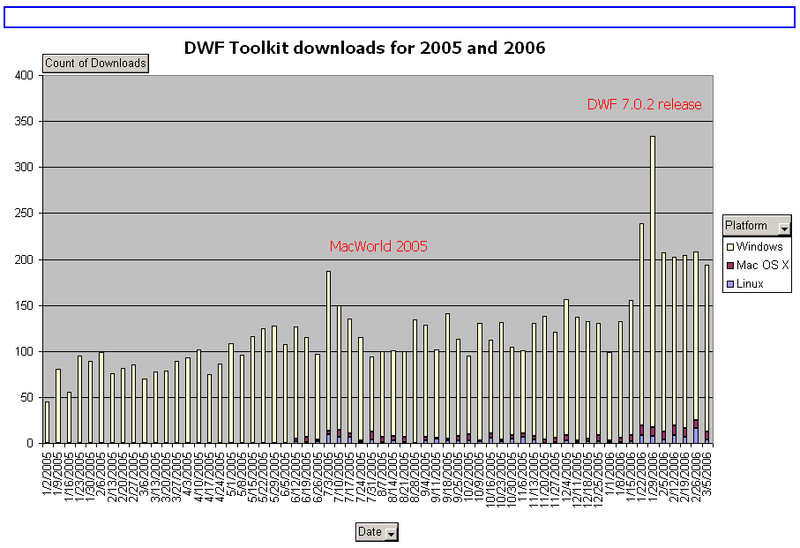 For 2005 about 100 new developers downloaded the DWF Toolkit per week. For 2006 that number has doubled. Microsoft Windows continues to be the most popular development platform, but Linux and Apple OSX are growing in numbers. To quote Ringo Starr, DWF popularity is growing "with a little help from our friends."